Writers On The Move: Interactive eBooks: The Next Generation of Children’s Books? Interactive eBooks: The Next Generation of Children’s Books? During the past few months, I have been forsaking many of my writing related activities to explore the possible future of children’s books. My publisher had asked me if I would like to create interactive eBooks for Apple’s iPad. I had no idea what went into creating an interactive eBook. But the idea intrigued me, so I said yes. Lest you think that this may be some normal, run of the mill request that a publisher might make of an author (cause it isn’t), allow me to give you some background. 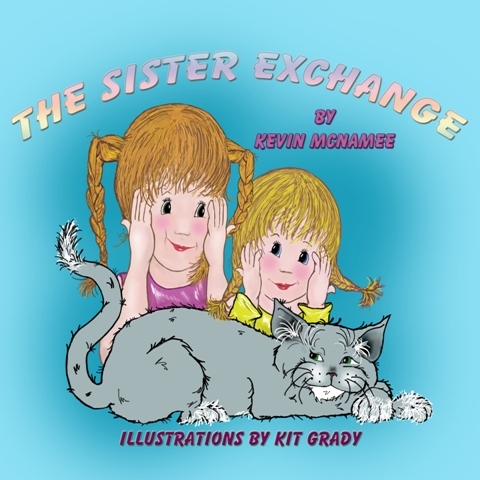 I have several children’s books published with Guardian Angel Publishing. I also have a background in IT. Unfortunately, being an author still requires that I maintain a day job, but little did I know how my two careers would mesh. My picture book, The Sister Exchange, was built on an iPad using an app builder called Demibooks. You don’t need to be a programmer to build a book with this app, but you do need to have a good understanding of graphic layering and how different commands will affect an object. There was still a pretty big learning curve for me. I went through about twelve different drafts of this book before I could consider it complete enough to hand over to my publisher. But I absolutely love the results. There are plenty of features to this book including, movable graphics, sound effects, music, animations, and author readings by yours truly. There are also bonus features such as a jigsaw puzzle and hidden autograph page with a personalized message. I even got my daughter involved; she provides the sounds effects for the characters on the illustration pages. So if you have an iPad and you would like to see the possible future of children’s eBooks, boy do I have the book for you! The link to the iTunes store is below. Kevin McNamee is a writer and poet. His other books include: If I Could Be Anything, My Brother the Frog, Lightning Strikes, The Soggy Town of Hilltop and What Is That Thing? This is so exciting, Kevin. Are you going to give us a workshop on how to do it? Sadly no iPad but it looks like I might have to get one. Thanks, Annie. The folks at Demibooks give a much better overview for building interactive eBook apps, than I ever could. I'm including a link to their support forums which contain user manuals and "how to" videos. Kevin, your article almost makes me want to buy an ebook. The whole concept of an interactive book is really interesting, and seems like a great fit for young children. Thanks for the interesting article. Seems to me you are find another niche for your expertise. Are you thinking about work-for-hire oppportunities for others who have absolutely no clue what to do? Thank you Maggie. You should go buy an eBook. There are plenty of top notch eBooks out there, even if they aren't interactive. At a recent conference I went to, I was told that eBooks are now about 50% of all books sold. I have considered freelancing, but between my day job, family, writing and promotion, I really don't know where I could fit that in. I'm intrigued about this type of eBook, but I don't think that I'd want to build a career around it. I'm first and foremost, a writer. As it is, promotion takes up more time than is to my liking. But it is necessary. There's no sense in writing a book and having nobody know about it. Congratulations Kevin. As writers, if we are willing to embrace the changes, it can be an exciting time. Thanks Mary Jo. It certainly is an exciting time with eBooks. This is all uncharted territory. I'm interested to see where this will lead. Wow! How fascinating! I was just reading about e-books having music put to the story. What'll "they" think of next?! I'm passing this information to my illustrator, Heather Paye, as I've been thinking my state stories really are not getting the benefit of being a "print" book with no interaction - I think they would do better if the kids can actually "interact" with my characters a bit and do their own predictions against the characters - (I think I've really envisioned it as the game it is but it is flat right now since they are in print and not as an app or game mode. I agree it will be interesting to see where these waters lead us children's authors. I know Elizabeth Dulemba did a story as an app for the ipad a couple of years ago, but I don't know what source she used to create the app or how she went about doing it (although I think she did post about it on her blog at some point when she was publishing Lula's Brew using the app). I wish I had a device to download apps to so I could check out your book just to get an idea of what to look forward to. If my illustrator says this sounds like a great idea and we can get the apps created without too much trouble and she needs some advice, would it be okay for her to contact you via email, Kevin? I think she would be very easily adaptable to working with creating app books instead of print books - but I will chat with her and then pass on information as necessary, if that is okay with you, Kevin. The Funny thing about this is that I just read about another "interactive" book or group for YA stories - read it on the blog - Keystrokes and Word Counts (it's a wordpress blog and I'm not looking at exact link right now). I think this may be the new wave of the future and seems to be coming a lot quicker than any of us really imagined or fathomed. Kevin, interactivity is one of the big benefits that people forget to mention when they talk about the benefits of publishing one's book as an e-book as well as in print. In fact, I see that an interactive book may be one of the few kinds of books that we might consider publishing ONLY that way--if it loses too much in print! I love this Kevin, it's excellent. I'd love to explore the idea of an interactive app book for adults too - with embedded author readings and video, etc. Thanks for being so innovative! I didn't know GAP was already doing interactive books. That's awesome! Wow, sounds fantastic! Now I need to purchase an Apple Ipad. Great work Kevin! This is a support forum for demibooks and will give you an overview of what's involved in creating an interactive eBook. I do caution you to thoroughly research not only Demibooks for creating the eBook, but Apple's policies since they will be the sole source of distribution through the iTunes store. My publisher is an approved developer for Apple, so the eBook was listed quickly on iTunes. If you will be self-publishing, I would research Apple before undertaking this project. I have heard that Apple is starting to crack down on what they consider to be "vanity apps". So I urge you to do your homework, the last thing you want to do is to spend a lot of time creating the app and have it rejected by Apple. One of the things I love about my publisher is that my books come out in several different formats. Some people might like to curl up with a print book while other might want to down load one. Guardian Angel will get a book to readers in any format they prefer. You're welcome Magdalena. Thanks for the kind words. Kevin, what a great way to bring stories to children. And, I agree that this will be the future for children's books - you can't beat interactivity for children. It is though, going to put a number of self-published authors and those published with companies that aren't up with the technology at a disadvantage. The average writer won't have a clue how to create an interactive ebook. I know you're not interested, but this will make a great side job for a tech savvy author. It's actually pretty versatile and it is extremely portable. I think you'll like it. I agree that it would be a great side job, but I'm afraid that it will be up to another tech savvy author to pick up the gauntlet. Between my day job, family, writing, and promotion, I figure that I have four full time jobs. So I need to pass on this one. Interesting post. I wish you well with your interactive book. Hi Kevin, There seems to be no end to the possibilities of this new technology. I am just now uploading a non-fiction e-book for middle grade girls to Amazon. I called it an interactive book because it has hyperlinks to information about the topics. Perhaps I should not have used interactive to describe it? I haven't completed the e-book conversion, still a few formatting problems, but I am assuming the hyperlinks will be live in the e-book conversion. Am I right? Thanks for the info.